Looking for the latest and greatest ornaments around? After much investigating, I've found some clever and whimsical variations on the usual Santa and snowman theme. These funky discoveries will help you to kick your holiday collection up a notch and bring some flavor to your tree-trimming. These ornaments by Reiko Kaneko are pretty dang cute. Made of fine bone china, these Christmas Chimera Baubles have "captured the image of the last creature that peered into its reflection," resulting in some funny and cockeyed portraits. Designs include cat, reindeer, dog and baby "reflections". I'd personally like to see my ex-boyfriends immortalized on some of those, as a nice reminder as to why I'm better off without them. 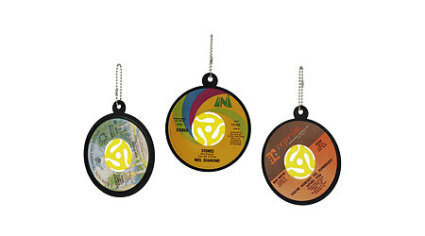 If you feel the need to revisit the days of yore this holiday season, these recycled 45s might spin you back. Handmade in New York, these ornaments come in sets of three. Since they're made from real 45s, it's anyone's guess as to which artist might be sent your way - perhaps you'll have the Partridges for your pear tree or the Monkees swinging off a pine bough. The yellow center adapter pops out just like on the real thing, and they hang from a ball chain. 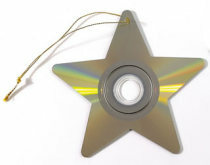 Another great idea in the world of eco-friendliness takes shape as ornaments made from recycled CDs and circuit boards. 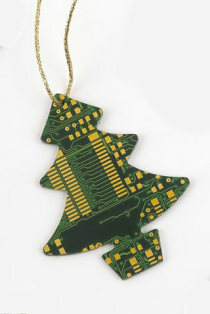 Electronics that usually have an inevitable date with a landfill are saved from that fate and are given new life, to be showcased on your tree or elsewhere for the holidays. These ornaments come in the standard holiday shapes - bells, trees and stars - and offer up a kind of post-modern feel to your décor. The designers assure us that "no CDs from decent artists were harmed in the process." Only those that didn't pass the rigorous screening process are sent to ornament heaven, where they are much happier in their new form. I particularly like San Francisco-based Rae Dunn's porcelain ornaments, which seem to mirror my level of enthusiasm for the holiday season. Rather than trumpeting holiday sentiments off the highest of mountain tops, these ornaments very calmly, if not apathetically, send the message that it's time to be jolly and merry and what not. 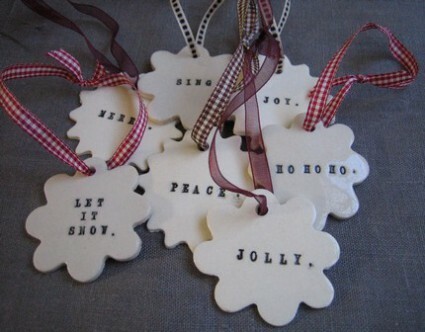 Each "snowflake" ornament is cut using a Swedish cookie cutter, and the letters are individually hand-stamped. 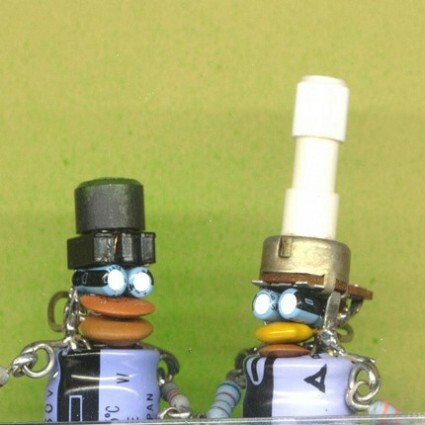 These capacitor people by obviousfront are hands down the funniest dang ornaments I've seen yet. Built from salvaged VCR, TV and computer components, these three-fingered metal friends aren't just for your tree - they can hang out all year long, worn as necklaces or earrings, or just suctioned to a nearby surface to keep a wide eye on things. Sizes range from 1.5" to about 4" tall. Freaking cute! So, if you wish to take a diversion from the usual holiday fare, I hope these can open some new vistas unto you. And if you've got your own ideas for cool ornaments, please send them my way. In the meantime, happy decorating!